This is the order our father gave to my brother JP and me as we were on our way to visit our mother. It was just over a year after our parents had separated. We were ten and twelve years of age. My father’s demands were the beginning of a process whereby he systematically forced my brothers and me to be hostile to our mother. It soon escalated to the point where we were being banned from seeing her and shortly after that we were banned from even speaking to our mother on the phone or even referring to her as our mother. Failure to comply with our father’s demands resulted in punishments, both physical and psychological. The result: we did not have any contact with our mother for eighteen years. When we looked back on our childhood as adults, we thought that what had happened to our family was rare and we held this belief until quite recently. We were midway through writing a memoir about the experience when, curious to find out if there were any other books similar to ours, we searched a few terms in Google and made a discovery. To our amazement, we discovered that our plight was not an exceptional case at all; rather it was happening regularly in Ireland and worldwide. The name of this epidemic is ‘Parental Alienation’. A prominent American clinical and research psychologist and author, Dr Richard Warshak, defines it as “the process, and the result, of the psychological manipulation of a child into showing unwarranted fear, disrespect or hostility towards a parent and/or other family members”. It is not defined as a condition by, for example, the World Health Organisation. We continued to research and we found websites, forums and Facebook groups for Parental Alienation with many thousands of members. The majority of the members are parents who assert that they have been alienated from their children whom they love and long to see. We knew that our mother felt this pain for eighteen years so we could sympathise with these people. Once we became aware that Parental Alienation was continuing to damage children’s lives today, we became determined do something. We wanted to finish our book and get it in the public eye to show the detrimental effects of Parental Alienation, especially given the scant coverage the problem received in Ireland. The court services tell us that out of the 5,700 custody and access applications made in 2014, a total of 2,016 applications were rejected. It concerns me that some of these applications were likely to be made by parents of children who were being manipulated and brainwashed like myself and JP had been. We were coached by our father to tell a solicitor, judge or psychologist that we didn’t want to see our mother. There has been recent legislation in light of the Children’s Referendum (in 2012) which alludes to Parental Alienation. The Children & Family Relationships Act was enacted in January 2016. It improves upon the old legislation in that it states that the Court shall facilitate that the views of a child are not borne out of undue influence of a parent. The Law Society submitted recommendations in anticipation of the bill, referring directly to ‘Parental Alienation’, stating that, “the Court may find it very difficult if as a result the child is refusing all contact and seems convinced that the other parent poses a danger”. I commend the Law Society for this but I believe the legislation alone doesn’t tackle the problem adequately. In my opinion, proper training is required for solicitors, judges and child psychologists to understand and identify Parental Alienation. The Irish Parental Alienation Awareness Association has dramatically called for alienation to be made an indictable offence. Andries van Tonder, its secretary, says that in Mexico, the parent encouraging alienation can be imprisoned for 15 years. “It is a serious form of child abuse to turn a child against a parent”, he maintains. In April 1993, when my brother JP was asked by our father’s solicitor how seeing our mother would affect him, he listed off our father’s words, even copying the numeric sequence our father had applied: points one, two and three. JP spoke like an adult, yet he had just turned fourteen. Speaking the words of the alienator parent is a characteristic of Parental Alienation that was identified in the early 1980s. It appears this solicitor didn’t identify that in 1993. Without proper training regarding Parental Alienation, I am not convinced that a solicitor would identify it in 2016. 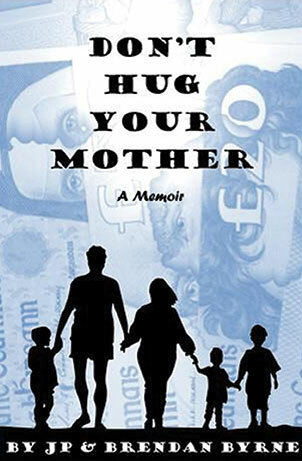 ‘Don’t Hug Your Mother: A Memoir’ by JP and Brendan Byrne can be purchased here on Amazon.